Board index Crab Care Bugs! For the discussion of any creepy crawlies that may have taken up residence in your tank, including mites. 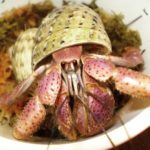 Please note that isopods have their own forum. In my house we always have trouble with stink bugs They are so gross and disgusting all year round . I was wondering.....if a stink bug gets into the hermit crab tank what will happen? Are stink bugs harmful to hermies or will they fight them? I'm not sure what to do to keep them out if needed. A good fitting lid will be a good idea, whether it's a screen lid, or a tight fitting glass... An bit of prevention is better than tryna find the cure. Otherwise, I imagine that they may not run into problems, unless they come across a moulting crab. IMO, no animal will not say no to an easy meal, and a moulting crab is the definition of that. Okay thanks so much!!! Next year I am planning on getting a 20gal tank for my 2 crabs and a sliding glass lid. Do you think that will do the trick? From what I've seen on the sliding glass lids, yes. Stink bugs don't dig so there's no risk to molters unless it's a surface molt. The worst that has happened here has been them drowning themselves in various water dishes. Apart from the smell, I've not had any issues with it with any of my animals. They really are awful, aren't they? They climb into my vacuum to hide when it's stored away, and then when it gets turned on WHOOO stank! YES they are terrible But I'm glad to know that they most likely won't be a problem for my little critters!!! They are just such a pain and I would hate it if they bothered my crabs any.